Does anyone know of a way to keep this in place? I use it exclusively in a table and losing that pin means I lose the ability to raise and lower it above the table. I haven’t looked at mine in a while (it’s under the table) but I think they use slotted spring pins. 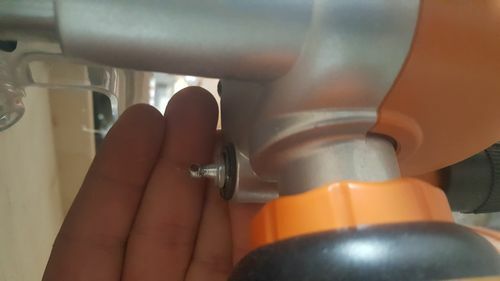 If the pins keep slipping out, you may need to get a bigger spring pin, or expand the one you are using with a screwdriver or awl or something. I have tried expanding the pin, but I think the hole is just to big for the one I have. I actually have lost the original pin, and Triton is sending me a new one… I may end up having to buy a larger one as you suggested. Mine fell out a few times. CA glue was the cure. Love this site. Problems resolved. It’s a good thing. He stated Triton is sending him a new pin so he probably already has contacted them. CA or Lok Tite should be more than enough. I have had problems with my Triton router from the beginning with things like this. Especially the motor brush covers. They break if you even look at them sideways. And you have to take them off and on if you need to clean out the little teeth on the posts that get clogged with sawdust from raising and lowering. Or at least I had to to clean something in the past. They shattered to pieces and I have had one replaced with a piece of oak dowel held in place with a small strip of ipe and some zip ties! Yes, it looks weird and I don’t like it, but it has been like that for two years.